Heat oven to 350°F. Place biscuits in 9-inch round cake pan, in even layer. Sprinkle biscuit tops with Demerara sugar. Bake about 15 minutes, or until golden brown. Cool completely. Meanwhile, place jelly in large microwavable bowl. Microwave uncovered on High 1 minute or until melted. Add strawberries; toss evenly to coat. In large bowl, beat whipping cream with electric mixer on high speed until soft peaks form. Add sour cream and granulated sugar. Beat to soft peaks again. With serrated knife, split biscuit cake in half horizontally; being careful to hold the biscuits together. Place bottom biscuit cake half on serving plate; cut side up. Top with 5 cups of the glazed strawberries and biscuit cake top. Dollop top of cake with whipped cream. Place remaining glazed strawberries in center of whipped cream. Sprinkle with candied pecans. 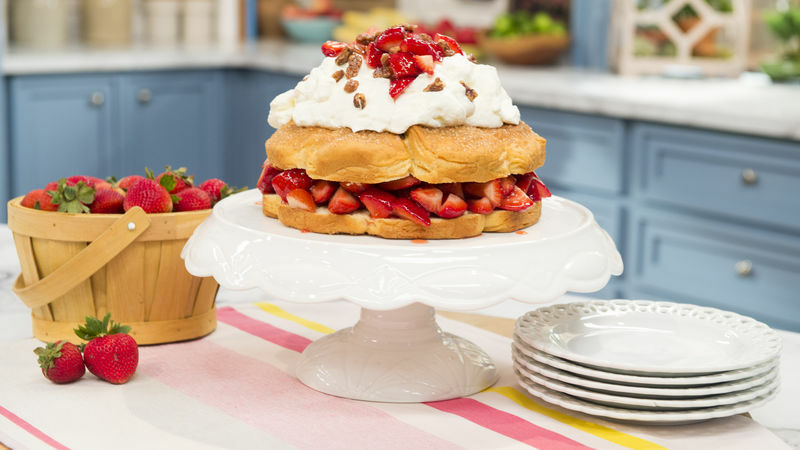 Inspiration for this recipe came from Pillsbury Bake-Off® Contest winner Amy Nelson’s fond memories of picking fresh strawberries on her grandparents’ strawberry farm when she was a kid. Stacked in wooden quart containers on her grandparents’ porch, the taste and smell of these sweet strawberries were unlike anything Amy has ever been able to find at a store, and hand-picking berries soon became a beloved family tradition. From processing and freezing the strawberries to turning them into sweet strawberry pies, ice creams, shortcakes, preserves and her favorite dessert—strawberry freeze—there was almost no limit to the delicious recipes Amy’s family could make with them. Amy won the 48th Pillsbury Bake-Off® Contest with her Bejeweled Cranberry-Orange Rolls, inspired by her mother’s cranberry salad recipe served at holiday dinners. See her grand-prize recipe and more from past Pillsbury Bake-Off® winners by visiting the Pillsbury Bake-Off® Contest page.